1. Cook the rice in boiling water for 20-25 minutes until tender, then drain and cool completely. 2. 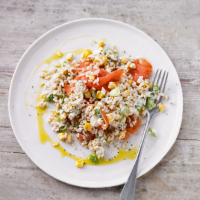 Mix in the sweetcorn, lemon zest and juice, salad onions and salmon. Stir in the sour cream dip and serve.